In just 72 hours from now, Bajirao Mastani would hit the screens. One of the most awaited films of 2015, all eyes are on how big does it turn out, considering the fact that it has been marketed as nothing less than a magnum opus. 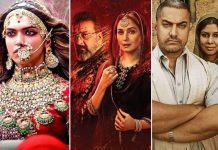 Director Sanjay Leela Bhansali has time and again delivered as per his big vision and if the excellent theatrical promo along with the superbly crafted songs are any indication, the Ranveer Singh, Deepika Padukone and Priyanka Chopra is set to be a biggie at the Box Office. From this point on, whatever collections come from India theatrical would add on to the profits for the film. This isn’t all as the film would also have a huge international release in the long run (starting with the huge China release in 2016) that would further continue to bring in revenue. Given the economics of the film, expectations that one has from it and the hype that the makers [Eros, Bhansali] have managed to create so far, Bajirao Mastani is well on its way to be a good commercial success. Now one waits to see how much entertaining does it truly turn out to be, once audiences begin to step in on 18th December.